Nexus Doors offers patio doors in uPVC, wood or aluminium that look great from inside and out, helping to make your room feel bigger and brighter. Our uPVC, wood and aluminium patio doors feature easy-glide panels, enabling easy access to your garden or balcony, so you can just slide the door open and enjoy the fresh air all year round. Nexus patios doors are made-to-measure and fitted to the highest standards. They’re available in two, three or four panels and in a range of colours, so you’re sure to find the perfect style to fit your vision for your home. 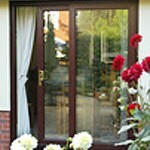 All of our patio doors are double-glazed and fully sealed to keep your home warm and minimise draughts. We utilise advanced glass technology and superior insulation to reduce heat loss, making your home more energy efficient and helping you to reduce your carbon footprint. 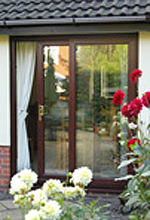 Wood, uPVC and aluminium patio doors are also easy to clean and virtually maintenance-free. Just wipe down with a damp cloth every so often to keep your doors looking as good as new. All of our doors come with enhanced security features such as toughened safety glass and multi-point locking to keep your home or work place safe and secure.